A would-be MP has waded in to a planning battleground, as objectors in Warkworth fight Northumberland Estates’ plans to build nearly 70 homes in the village. Campaigners, who have formed the One Voice action group, are trying to drum up support against the bids – split into three separate applications – branding it over-development. 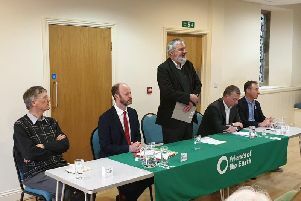 Now, Lib Dem parliamentary candidate Julie Pörksen has said it is crucial that resident opinion is taken into account, after attending a recent meeting of the group. She said: “I hope that everyone who has a view will express that view through the county council’s planning process and that those views will be listened to by planners, councillors, landowners and developers. Objectors say that support for their campaign is growing and they were ‘overwhelmed’ at the response at the recent meeting. John Wilson, from One Voice, said: “More than 80 people called in to offer support and offer positive ideas to oppose the planning applications. “We were delighted at the boost to the petition and the generosity to our fighting fund. An Estates spokesman said that the sites have been carefully selected, the schemes would benefit the community and that Warkworth has been identified as a sustainable location.